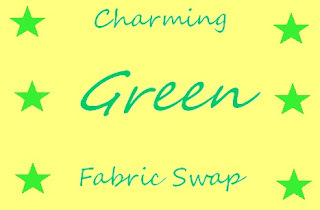 I've signed up to participate in Kelsey's Charming Green Fabric Swap. I think there are more openings; if you're interested, click here, to check it out. The rules are pretty simple, but basically you'll be purchasing (2) 1/2 yard cuts of green fabric, and cutting them into 5 inch charms; mailing them off to Kelsey with a stamped, self addressed envelope. She'll use the envelope to return your share of the squares. See her post for all the rules.